In the top paddock at Jamieson there is a walnut tree. My mother, who seems to get a terrible lot of airplay on this blog, was totally enamored with the fruit trees when we were children, particularly this one. Given, there are some lovely old ones on the property, remnants of its days as a dairy farm; a couple of lovely plums, an exotic mulberry, a persimmon and a lemon tree that produces large, strange looking thick rinded lemons like those from the Amalfi Coast. Perhaps her love for the walnut tree (and the persimmon) had something to do with having spent various periods in Europe in her youth, of having bought roasted chestnuts on street corners of distant capitals, of having tried bright orange persimmons which I still remember her pronouncing as much loved by the Italians (true). I remember the loving care that the lone walnut tree received; the fuss involved in trying to preserve its fruit, the nets and scarecrows and banners that were invented in a constant and losing battle with the cockatoos. 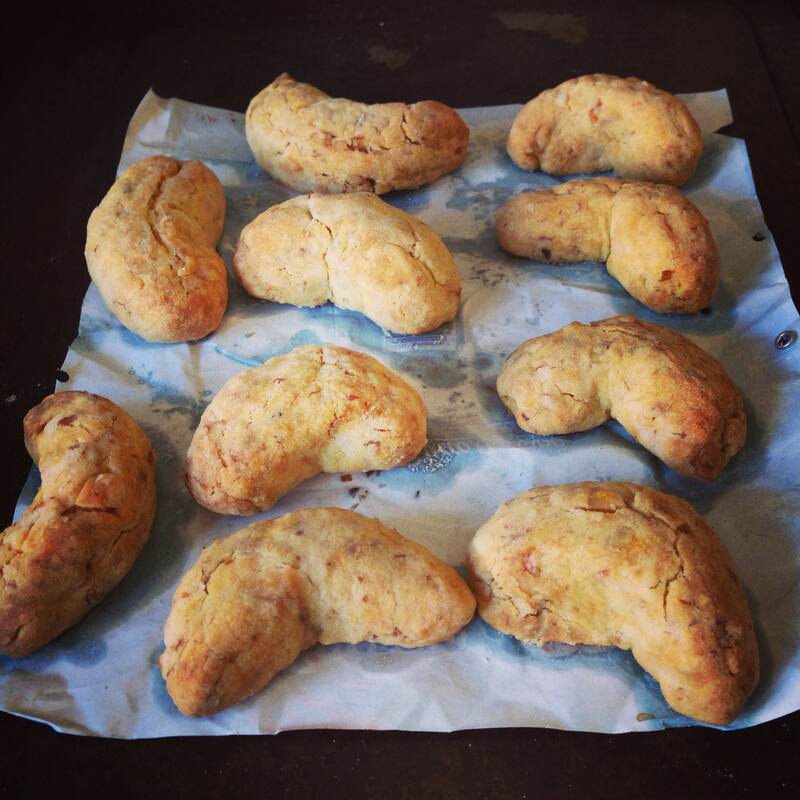 I’m not sure where Mum picked up the recipe for these lovely walnut crescents, but they appeared regularly throughout my childhood. 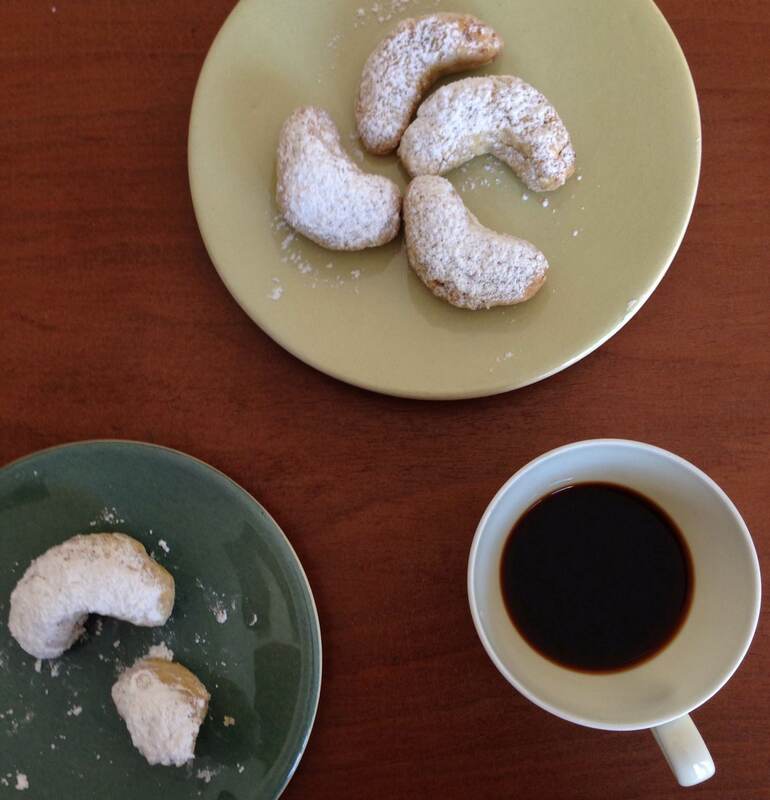 You do see walnut biscuits in Greek cake shops around Melbourne, the little crescent shapes drenched in thick icing sugar, but I am sure the Greek version would use olive oil rather than butter. The new seasons walnuts are at the market here in Italy, but for this recipe I’ve used older, drier walnuts, for the brittleness factor. I gave them a quick five minutes in the oven before chopping them, just to bring out the oil and aromas. They are a perfect with coffee biscuit. Start by giving the shelled walnuts a 5 minute toast in a 180 C oven. 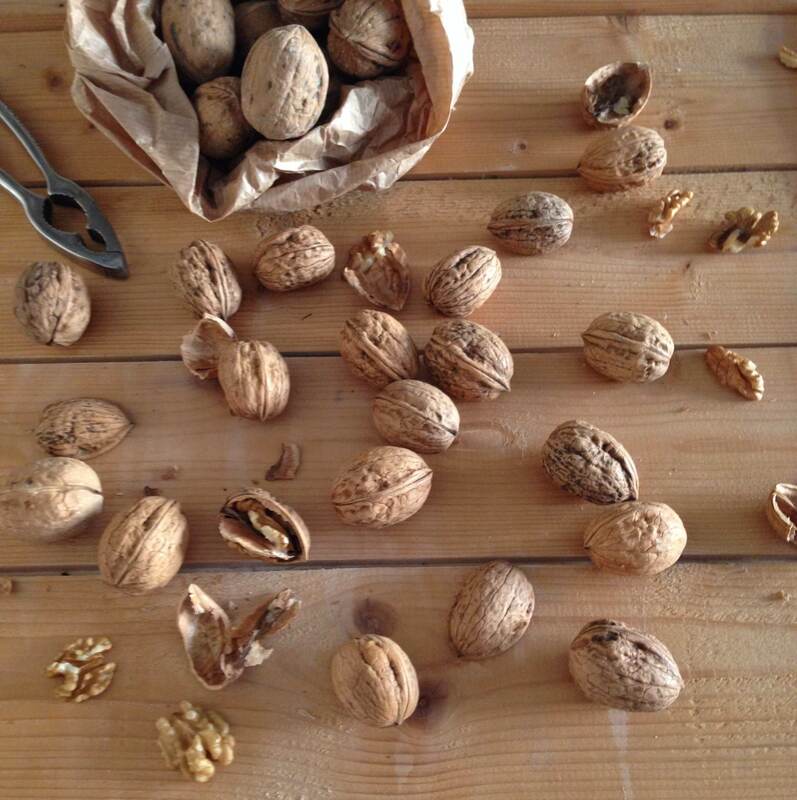 Chop the cooled walnuts well, discarding any papery covering that comes off the nuts. They should be chopped (or they could be wizzed in a food processor) to an almost meal, I like to leave a bit of roughness in there. 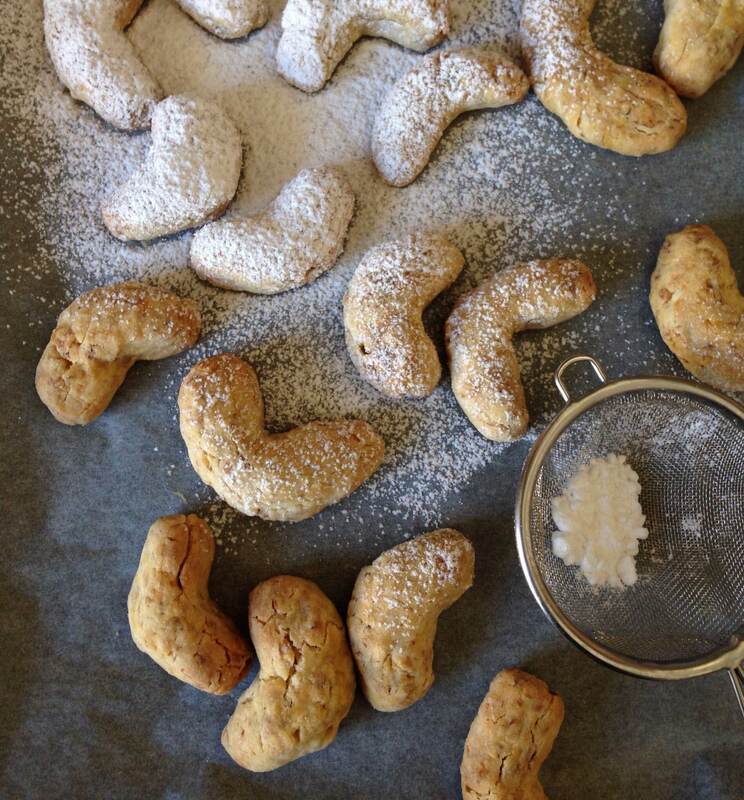 In a large mixing bowl mix the chopped walnuts, softened butter, flour, pinch of salt and sifted icing sugar. Mix well and then add one egg and a drop or two of vanilla essence. The mixture should now come together into a nice ball, and can be turned out onto a floured work surface, kneaded a little, and then wrapped in plastic film and rested in the fridge for half an hour. Cut slices of the dough and roll it into rough snakes. These can then be portion controlled into smaller pieces for the final rolling process. Each biscuit should be a neat (ish) rolled tube, which is then bent to form a crescent shape. Rolling can be as perfect or as rustic as you please. Lay on a tray lined with baking paper – I used the left over butter wrapper just as my mother does – and bake in a preheated 180 C oven for 25 minutes. Cool and dust heavily with icing sugar to serve. As you will have noted, I am always quoting the whit and wisdom of my Mother. (your grandmother). In my opinion far better this than wilting flowers on a grave. 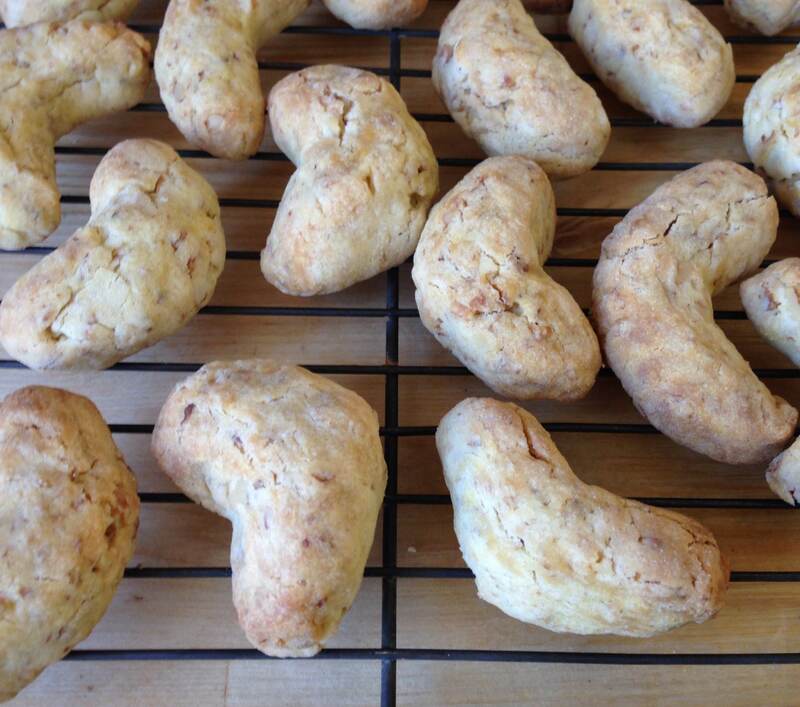 As for the crescents, will find a moment to make some, they sound delicious. Lizzie. Ps. Thinking about it I wonder if the recipe is Margie’s? We Will have to ask her. Hugs from Rome.